Posted on 6, October 2016 by EuropaWire PR Editors | This entry was posted in Belgium, Education, Internet & Online, Technology and tagged app, Ghent University, indoor navigation in public buildings, Prof. Nico Van de Weghe. Bookmark the permalink. GENT, Belgium, 06-Oct-2016 — /EuropaWire/ — Scientists of Ghent University have developed SoleWay, an application for indoor navigation in public buildings. They call on everyone to add as much routes as possible. In that way, SoleWay can become the wiki of indoor navigation. You can find the entrance of a building quite easily using a gps, but once you’re inside, it often gets more difficult. 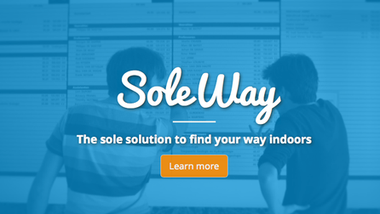 Soleway – ‘the solution to find your way indoors’ – wants to change this. On the website of Soleway, you can add routes in public buildings, so that other people can find their way. “The ultimate goal of SoleWay is to become an app for indoor navigation that can be used worldwide,” says Prof. Nico Van de Weghe of the research group CartoGIS (Department of Geography). You can find and add routes on SoleWay.